You know that it can get extremely hot in Texas with a heat index sometimes as high as 105F. Despite regular maintenance, air conditioning and ventilation equipment is always susceptible to normal operating wear and tear year round, since we need both heating and cooling. Keeping your business cool without breaking your budget has been our commitment to North Texans since 1975. Money-saving maintenance is something everyone appreciates. 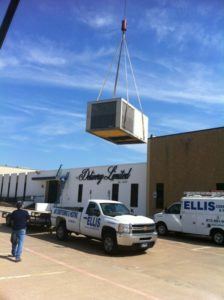 The Ellis A/C ensures your commercial enterprise receives exactly the repairs or services needed, in a timely fashion. 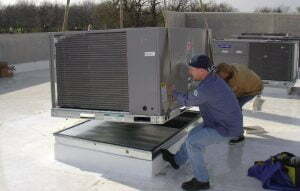 Our commercial HVAC experts are one phone call away to assist your business with any HVAC Service and Repair needs. Our team can be dispatched from one of our many Dallas-Fort Worth area locations to take care of anything from minor needs to urgent calls. We have provided our services to North Texas businesses for more than 40 years and the average experience amongst our trained technicians is 15 years. You can rest knowing the team inspecting and repairing your indoor air equipment can quickly diagnose, adjust or repair your system to get you back up and running. Call us today at (972) 291-9316 to get our team started on your business’s commercial HVAC repairs.